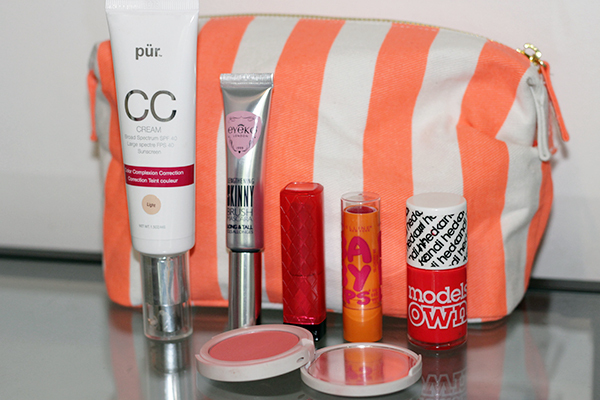 During this summer I've had quite a few new additions to my usual makeup bag. I've swapped the matte lipstick and dark eyeliner and introduced a range of red and orange tones into my everyday look. I've narrowed it down to 6 products to include in my Neon Striped Bag from Topshop including a light coverage base, sheer lipsticks, long skinny lashes and neon nail polish. Summer proof and fuss free. After days of using the tiniest bit left in the my Nars Sheer Glow foundation, while I wait for my new one to arrive I decided to give the Pur CC Cream in Light* a try. At first I wasn't a fan of this CC cream. The colour wasn't right for me and the application wasn't all that great with a brush. Now that summer is here and I've been out in the sun, the colour is a much better match and applying it using my fingers gave a much better finish than before. One of the main selling points for me is that it has SPF 40 so it’s the perfect base to put on if you're off on holiday and don't want to wear anything too heavy while still protecting your skin from the sun. I’d say the coverage is more on the light side but it’s definitely buildable into a medium base. If you're slightly darker than Mont Blanc in Nars Sheer Glow, the Light shade will be perfect for you. I've never been a fan of huge chunky mascaras. I prefer the tiny brushes that give your lashes a doe-lash effect which provide more length than volume. I've recently been trying out some Eyeko mascaras but the Eyeko Lengthening Skinny Brush Mascara* has been my staple this summer. As the name suggests, the brush is very skinny and the brush has a sort of swirl design which means it can catch all the tiny lashes. It’s quite a wet formula but dries really quickly and I haven't had any issues with smudging or flaking in the hot weather. I have a couple more to try out so I'll probably do a separate post with swatches soon. The nail polishes I've been purchasing recently have been mostly corals but the summer shade I always go back to is the Models Own Hedonist Nail Polish. It’s just the ultimate neon red and nothing else quite compares. I do quite like that it has a more matte finish but occasionally I'll apply a glossy top coat for a different look. In the summer my lips need a little bit more attention so if I don't feel like wearing a lipstick I'll pop on the Maybelline Baby Lips in Cherry Me. These aren't out in the UK yet but Lisa very kindly brought me back this shade from her holiday in Vegas. If you're looking for a bright pop of colour, you won't find this here but Cherry Me makes your lips feel so hydrated with slight pinkish/red tone to the lips. I’d say its more along the lines of a tinted lip balm. I think they're coming to the UK in August so I'll be looking forward to trying more shades. The shade I've been wearing religiously throughout summer has to be the Revlon Lip Butter in Wild Watermelon. When I first reviewed the Revlon Lip Butters I only had 3 shades, since then it’s now increased to 7 but I have to say Wild Watermelon is hands down the best shade in the range. Or at least in the shades I've been able to try. It’s just the most gorgeous highly pigmented shade, with pinkish/red tones and it feels so hydrating throughout the day. It’s just the perfect summer shade. I even managed to convince Lisa to try one for herself, probably due to the fact I was buying 4 at the time! My Topshop blushers have been a bit neglected lately so I decided to reintroduce the Topshop Powder Blush in Pop into my routine. It’s one of their powders, sort of the powder equivalent to Neon Rose. The shade is basically a bright neon pink which comes out very highly pigmented so a little goes a long way but when you blend it out with a brush it gives a really lovely glow to the cheeks. I've really enjoyed adding a bit more colour into my routine, it definitely feels a lot more summer sporting bright neon nail polish and a bold sheer lip. Let me know what summery additions you've been introducing into your collection.